found the subject they studied in summer school (intensive learning mode of 5 weeks) was more enjoyable (motivational) than any other business course in their previous studies, indicating that the process of learning is significant. Today, education is frequently described (for instance, by Svensson (2007) and Thomas (2007)) as a knowledge economy; today’s students have unlimited access to information and the challenge facing teachers is motivating students and setting learning opportunities for students to engage with the subject (Entwistle & Trait 1995; Ainley 2004). It is also recognised by business educators that Business Schools have gained strong recognition over the last 100 years (Thomas 2007) and that teaching and learning is no longer about the transfer of programmed knowledge of information; rather, it is a transfer of experiential knowledge of information (Johnson & Spicer 2006). Teaching and learning today is about transferring content based knowledge, process knowledge and everyday knowledge into cognitive, physical, and affective outcomes that are integrated throughout the lifespan (Wilson 2000; Jarvis 2003; Tovey & Lawlor 2004). The Department of Employment Education and Training in Australia described ‘good teaching[as that which] makes students think and foster[s] student development as a whole person’ (1994 p.8 & p.46). To help business students learn to “think like marketers,” educators need to seriously consider, ways of moving beyond the traditional modes of instruction (Ali and Ho 2006) into learning methods that tend to be experience-based and contribute to effective learning (Revans 1980; Howard, Mitchell, Spennemann & Webster-Mannison 2000; Tovey & Lawlor 2004; Johnson & Spicer 2006). This paper investigated the undergraduate business students’ attitudes/perceptions of a marketing subject during summer school. As a result, a theoretical framework was formed as shown in figure 1. As shown in figure 1 above, there are three independent variables and one dependent variable for this research study. The duration of study is taken to be the period of learning. Motivation is defined as the essential factor in teaching and learning, as supported by Ainley (2004) that encourages students to work and enjoy learning in the tertiary sector of education. Environment is taken as the weather, season, and classroom situation. Effectiveness of Learning is the dependent variable that is predicted to change according to the three independent variables (duration of study, motivation and environment),either singularly or collectively. Duration of Study is taken to be period of learning engagement, that is, the time students spend in valuable reading and studying (Ainley 2004). Typically, this takes place twice a week for a period of three hours student-facilitator contact times over five weeks of curriculum design. The duration of study for summer school is intensive yet tends to be rather interactive, because tutors who speak for more than 80% of the time make the encounter boring (Harasim 1999). Intensive teaching and learning facilitation is over five weeks and is focused towards a high level of interaction both between staff and students and also among students themselves (Tutty & White 2006). Students have the obligation to fulfill course related tasks during this time period and are often obliged to be present and interact actively with the other students for group assignments and with lecturers (Svensson 2007). Motivation is the energy and direction that contributes towards behaviour directed towards learning, and provides reasons for certain positive behaviour like desire to learn and why we do what we do, as supported by Ainley (2004). The knowledge and subject of presentation is important because it is about ‘generating an interest, presenting things in a way students understand and find interesting, motivating and keep a keen interest in learning’ (Department of Employment, Education and Training 1994 p.52). Motivation energizes learners. It switches learners on, resulting in the direction of time and energy to the task. Motivation is goal-directed. Motivated learners work toward an end-point, or more importantly, the reward that becomes available at the end point. Motivation is selective. If a student has a higher level of motivation for subject A in comparison to subject B, the student will direct more attention to subject A; motivation puts priorities on activities. Motivation patterns learner behaviour. Motivated learners are often organized and work to a plan and this adds efficiency to the learning process. Positive emotions are key motivational drivers to teaching and learning (Ainley 2004). Environment for this research article is taken to be the season or traditional classroom and in this case, the environment is the summer season in an intensive learning classroom which tends to consider contemporary research into students’ perspectives of situational learning (Ainley 2004; Tutty & White 2006). Learning environments shape the approaches students adopt for learning, and ultimately learning outcomes (Entwistle & Tait 1995). According to Drea, Tripp and Stuenel (2005), students learn best when the educators successfully create an active form of learning environment. However, new learning environments tend to be more integrated workshops with wireless student centered and active approaches to learning, such as the tablet classroom which is believed to be an effective form of learning (Tutty & White 2006). Students tend to learn from other students, student groups, student to instructor and student-to guest educator communications; therefore, these interactions provide students with the opportunity to learn from each other and to become involved in the learning process as each shares his or her own personal experiences (Kochtanek & Hein 2000). Effective learning can be equivalent to productive learning, and consists of components such as resources (tools, informational resources and material that students use in completion of the task); task (students are engaged in an activity example problem solving); support (a set of conditions that facilitate students task completion) and evaluation (formative evaluation of students’ learning informed by their approaches to the task and the outcome) as implied by (Churchill 2006). As a result, effective learning makes students think and learn how to synthesise what has been learnt and devise a conclusion. Learning that is focused towards constructive learning rather than teacher centred learning, where there has been a transformational shift in the classroom from teacher-centered to student-centred practices, is now widely advocated (Jonassen 2000). The lack of effective learning strategies directly leads to poor achievement (Lau & Chan 2001); therefore, Butler and Cartier (2004) discovered that students meta cognitive knowledge, task conceptions, and active and reflective deciphering of task requirements are key determinants of successful performance, and that effective learners habitually interpret tasks as a first key step in learning. Rodrigues (2004) revealed through empirical research that different students and different situations require different instructional techniques for effectiveness in teaching and learning. The introduction of web-based course instruction tends to be the future direction of learning because it tends to seek stimulating interactions between students, and between students and the instructor, in the pursuit of improved learning and knowledge base construction. It offers the opportunity to re-examine models supporting learning and the transfer of knowledge among students enrolled in such courses through vast distances (Kochtanek and Hein 2000). Students involved in this research were enrolled in 2005/06 introductory marketing subject called Introduction to Marketing (BHO1171), which is a core subject for all students who enrolled in the Bachelor of Business degree at a large public university in Victoria, Australia. All the students who enrolled in BHO1171 during the summer semester would have completed at least two semesters of a six semester Bachelor of Business degree program. There were 49 students enrolled into BHO1171; more than 75% of them are Australian students and the rest came from Asia, Europe and Africa. In brief, BHO1171 is an introductory subject for marketing and marketing management with a focus on the marketing of consumer goods and services. Students are introduced to the concepts of marketing strategies, and given the opportunity to apply the theoretical aspects of the course to problems similar to those encountered in the business environment. The aim of BHO1171 is to define the major elements of the marketing process and to build an understanding of the role of marketing in the social and economic environments, and as a managerial tool. As this is an intensive subject, it was taught in two and a half hours of lectures, followed by a tutorial of one and a half hour’s duration, twice a week for five consecutive weeks continuously. A variety of presentation techniques, including audio-visual media and case studies, were employed. Student participation in tutorials is essential for the successful completion of the subject. To attain a pass in BHO1171, students must achieve at least 40% in the final exam and complete all other assessment components as shown in Table 1. Failure to receive at least 40% in the final examination will result in a maximum grade of 45% being awarded for the subject. The triangulation method was used, in which most data were collected through questionnaire form and a small percentage through interpretative form. We collected data from students who enrolled in BHO1171 in the summer semester 2005. Students were asked to complete a questionnaire survey that required about five minutes to complete, which was administered at the end of the final lecture. It was made clear that this was not part of the assessment. The approval of the Ethics Committee of the university was obtained in late 2005/06 to preserve the rights, liberties and safety of the participants. In addition, before conducting the questionnaire survey, we explained the purpose of the study and the ethical rules to each participant. All students were informed that under the ethical rules, they were participating voluntarily and no risks, such as psychological, moral, legal or other risks, would occur with them. Students were asked a total of 15 questions developed by the researchers. Most of the questions were concentrated on how students’ perceptions of the intensive face-to-face marketing subject have contributed to their learning, as well as the perceived benefits associated with enrolling in summer school. Students were also asked to indicate their perception of whether attending the summer semester is more enjoyable and/or difficult as compared with other business subjects they enrol in on a normal semester basis. Responses were based on a five point Likert scale; from agree strongly to disagree strongly. Students were asked to rate the perceived value of attending an intensive marketing subject in the summer school, in terms of enhancing their learning experience (as shown in Table 2). In general (question 1 and 2), students either strongly agree or agree that there is no difference if they choose to study during summer school or during a normal semester basis. Also, 85 percent of our students prefer to enroll in summer courses rather than normal semester basis. At the same time, more than 80 percent of our students (question 3 and 4) claimed that the summer school with shorter learning time is an advantage for them and it is more efficient and effective in their learning since this is an intensive subject. The majority of students agreed that they can easily get any valuable feedback and/or help from the lecturers or tutor via email, telephone or in-person contact just as in a normal semester (question 5 and 6) and they disagreed that the intensive marketing subject is more time consuming as compared with normal semester learning (question 7). Amusingly, our students reported that summer school is more enjoyable than any other business courses in their previous studies (question 8). The overall responses were very positive as indicated by the mean score of the one to five scales, where less than three indicates a degree of agreement with the proposition and greater than three favours disagreement. Everything was great keeping in mind the conditions! Classes are more active, no real problems! Enjoying marketing finally. The lecturers went way too fast leaving me behind from time to time! There was no class from November 20  Jan 3. Perhaps a week or two expansion of summer school would make life easier. When you provide definitions and extra information, allow time to write down … the rest is all good! Tutorial is tougher, expect more work and lot of stuff need to put in. Apart from the questionnaire, another interesting finding emerged when looking at students’ performance in all the assessments (as shown in Figure 2). The assessment results can be used to substantiate why marketing students state that face-to-face intensive marketing subjects were of benefit to them compared to other business courses in which they enrolled on a normal semester basis. As shown in Figure 2, more than 90 percent of our students achieved at least a pass in their first assignments and all students received credit or above in their group assignment. What is more encouraging is the fact that 75 percent of them secured a pass or above in their final examination. Finally, the final result indicates that the passing rates increased significantly, as only 6 percent of the students who enrolled in BHO1171 have failed in this subject (scored less than 50%) as compared with the previous 2 semesters in 2005 (semester 1 and 2 which run in normal semester basis) in which failing rates were more than 15 percent. Despite the overall positive results, this study is limited by the fact that it only involves a small number of students for the summer school of Marketing at the Faculty of Business and Law. 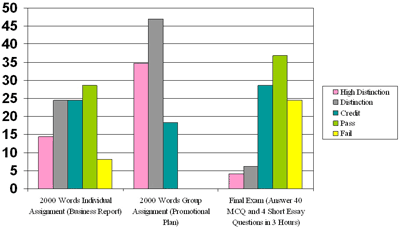 Moreover, the study did not compare and contrast different study modes; for example, apart from looking at students’ perception of teaching and learning in the summer school, it would be useful to see if these perceptions are different among students who have taken such subjects by block mode on a normal semester-length basis. Further research is planned to investigate which subjects are thought in advance to be most suitable/unsuitable for intensive teaching throughout the normal semester and the extent to which these perceptions change after experience of the block. This study offers momentum for the idea that marketing subjects that run in the summer semester can indeed provide superior learning to what may be encountered in a traditional semester-length subject. The work presented here also illustrates that students in summer semester constantly sought for support from the lecturers or tutor, just as in normal semester. In other words, the instructor is also a key ingredient in the success or failure of intensive teaching and learning. The enthusiasm, encouragement and support of students during the summer school lecture or tutorial are no less important than in a semester-length face-to-face classroom. In conclusion, these findings have several implications for the design and development of marketing related subjects at the tertiary level, and for future research in examining the usefulness of summer school teaching and learning towards in a more action-learning mode where workplace-centred learning may contribute to more effective learning. We support the concept proposed by Howard, et. al (2000); Kemp (1999) and Svensson (2007), that today shapes tomorrow. and that there is a need to make universities more entrepreneurial, economically efficient, and industry oriented through experiential-knowledge based learning. Ainley, M. (2004). What do we know about student motivation and engagement? Paper presented at the annual meeting of the Australian Association for Research in Education, Melbourne, 29th November 2004. Butler, D. L. & Cartier, S.C. (2004). Promoting Effective Task Interpretation as an Important Work Habit: A key to successful Teaching and Learning. Teachers College Record, 106 (9), 1729-1758. Churchill, D. (2006). Student-centred learning design: key components, technology role and frameworks for integration. Synergy, 4 (1), 18-25. Department of Employment, Education & Training. (1994) Report of a research project Teaching Quality: The Development of Valid Instrument of Assessment funded by the Commonwealth Department of Employment, Education & Training as part of the Evaluation and Investigation Program written by Michael Lally and Marian Myhill from the Graduate School of Education, The University of Western Australia. Drea, J.T., Tripp, C. & Stuenkel, K. (2005). An assessment of the effectiveness of an in-class game on marketing students’ perceptions and learning outcomes. Marketing Education Review, 15 (1), 25-33. Entwistle, N. & Trait, H. (1995). Approaches to leaning and perceptions of the learning environment across disciplines. New Directions for Teaching and Learning, 64, 93-103. Harasim, L. (1999). A framework for online learning: The virtual-u. Computer, 32 (9), 44-49. Howard, J., Mitchell, D., Spennemann, D. and Webster-Mannison, M. (2000). Is today shaping tomorrow for tertiary education in Australia? International Journal of Sustainability in Higher Education, 1 (1), 83-96. Jarvis, P. (2003). The whole Person, Learning Practical Knowledge and the Learning Organisation, ed by Prem, K 203, Organisational Learning for all seasons: Building Internal Leadership Institute, Singapore. Johnson, C. & Spicer, P.D. (2006). A case study of action learning in an MBA program. Education and Training Journal, 48 (1), 39-54. Jonassen, D. (2000). Towards Design Theory of Problem Solving in ETR & D, 48 (4), 63-85. Jonassen, D. (1999). Designing Constructivist Learning Environments in C.M Reigebath ed. Intructional Design Theories and Models: A New Paradigm of Instructional Theory, 2, Hillsdale, NJ: Lawerence Eilbaum Associates, 215-239. Kemp, D. (1999). New knowledge, new opportunities: a discussion paper on higher education research and research training. Department of Education, Training and Youth Affairs, Canberra. Kochtanel, T.R. & Hein, K.K. (2000). Creating and Nurturing distributed asynchronous learning environments. On-line Information Review, 24 (4), 280-293. Lau, K.L. & Chan, D.W. (2001). Motivational Characteristics of Under-achievers in Hong Kong. Educational Psychology, 21 (4), 417-430. Revans, R. (1980). Action Learning: New Techniques for Managers. Blond and Briggs, London. Rodrigues, C.A. (2004). The importance level of ten teaching/learning techniques as rated by university business students and instructors. Journal of Management Development, 23 (2), 169-182. Svensson, G. (2007). Are university students really customers? When illusion may lead to delusion for all. International Journal of Educational Management, 21 (1), 17-28. Simcock, A.L. & Chiond, J.A. (1995). We are only here for the marks: Overcoming the communication barrier to learning. Victoria University of Technology’s Symposium proceeding 1995: Teaching Matters. Thomas, H. (2007). Commentary: Business School Strategy and Metrics for Success. Journal of Management Development, 26 (1), 33-42. Tutty, J. & White, B. (2006). Tablet classroom interactions School of Information Technology. Charles Darwin University, Northern Territory.